Clocking in at just over four miles, it’s difficult to imagine today’s Allentown & Auburn Railroad as the link in a proposed eastern anthracite trunk line. The Allentown Railroad was proposed in the 1850s to connect the Central Railroad of New Jersey at Allentown, Pa., with the Pennsylvania Railroad main line at Rockville, creating a shortcut for anthracite coal delivery to the port of New York. Working with the Dauphin & Susquehanna Coal Co., CNJ obtained a charter in 1853. A year later, the Auburn & Port Clinton was chartered to connect the D&S at Auburn with the Allentown Railroad at Port Clinton. Construction began in 1855, following a route from Allentown southwest through Topton and Kutztown, following Sacony Creek and eventually pushing through Hamburg to reach Port Clinton. By 1856, the CNJ had aligned itself with an alternate route through Reading, and abandoned the Allentown project. The other investors continued their support, and a roadbed was graded nearly the entire length of the line. The Allentown & Port Clinton was merged into the Allentown Railroad in 1857. The financial panic that year halted any further construction. The D&S was reorganized in 1859 as the Schuylkill & Susquehanna Railroad, and came under control of the Reading. Later that year, the East Pennsylvania Railroad opened, connecting Allentown and Reading, which negated the need for the Allentown Railroad. The Reading gained control of the Allentown Railroad in 1860, but the project remained dormant. Officials took a second look at the route in 1869, but also took out a lease on the East Pennsylvania line. At the urging of local citizens, four miles of rail were laid on the Allentown grade from Topton to Kutztown, which opened for business by 1871, later becoming the Reading’s Allentown Branch. Another small segment of the old right-of-way was used by the Reading to reach the Mack Truck plant in Allentown in 1917. Oddly enough, the Allentown Railroad remained on the books until it was merged into the Reading in 1945. The Reading’s “East Penn Local” served Kutztown, as well as all the customers between Reading and Allentown. Freight traffic included Kutztown Foundry, as well as several feed mills, coal dealers, shoe factories, printing companies, a dairy, and two coal-fired power plants. Regular passenger service ended in 1934. When the Reading was folded into Conrail in 1976, the Allentown Branch was handling about 400 carloads a year, which warranted subsidized operation. However, the economic recession of the 1980s forced many smaller companies to scale back or close altogether. In 1983, the Pennsylvania Department of Transportation (PennDOT) assumed control of the Allentown Branch, as well as the former Reading’s Perkiomen and Colebrookdale branches, together called the Perkiomen Cluster. The Anthracite Railroad was the first successful bidder to operate the line, followed by Blue Mountain & Reading (later Reading, Blue Mountain & Northern) in 1989. Freight traffic was on the decline when East Penn Railways won the bid for operation in 1995. Freight service was sporadic, but some regular passenger excursions were operated. In 2000, PennDOT put the Perkiomen Cluster up for sale, and the Borough of Kutztown was the winning bidder for the Allentown Branch. The property is now managed by the Kutztown Transportation Authority. In 2013, Trinity Industries (operators of the former Kutztown Foundry) announced it would be closing the plant. East Penn announced it would be ending operation on the Allentown Branch as a result. The KTA turned to Mike Bast and Pete Cole at Central Pennsylvania Rail Corp. and asked if they would be interested in operating the line. Bast is no stranger to the world of railroading, getting his start at age 11 with the Reading Company Technical & Historical Society and since working for a number of Pennsylvania short lines. In October 2013, the Allentown & Auburn Railroad was reborn. Most of the heritage equipment in use on the railroad was temporarily stored on the Luzerne & Susquehanna, thanks to the generosity of Steve May. The Allentown & Auburn, like most tourist railroads, has a varied schedule depending on the time of year. 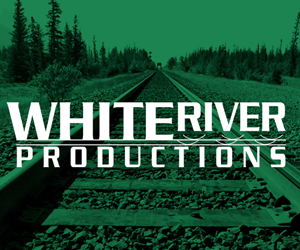 The railroad is still experimenting with special events like wine trains (which have been quite successful), and there is the occasional railfan event and visiting steam locomotive operation. For those just visiting and looking for photographs, there is a lot of variety on the line. Obviously, the former Reading Kutztown station is a highlight, but in the immediate area are also some old factory buildings that can be worked into shots, especially when the locomotive runs around the train after arriving from Topton. 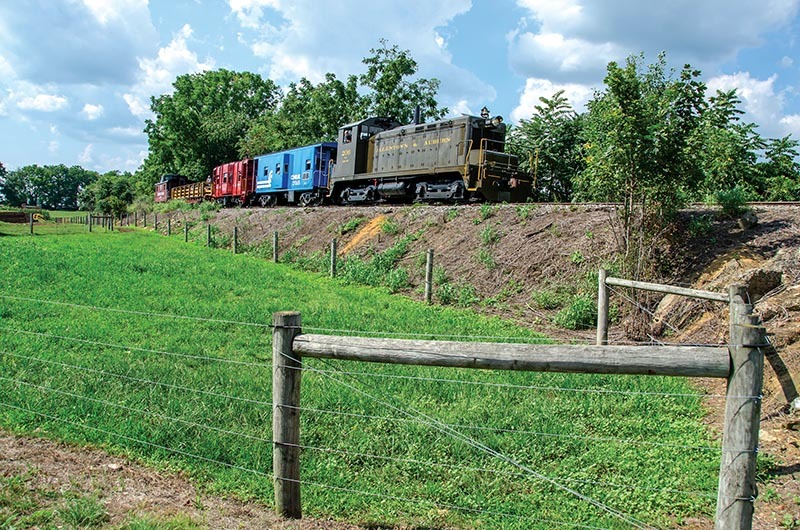 At the eastern edge of Kutztown is Kohler Road, which provides a nice elevated morning view of a train departing Kutztown, and an afternoon view of a westbound train passing through the small cut. If you follow Kohler Road north from the grade crossing, it will twist around and cross the tracks again. A late summer train bound for Kutztown will be lit nicely crossing the field on the north side here, and morning Topton-bound trains can be shot from the south side any time of year. Shots are also available at Topton. The shop is on the south side of West High Street, so you’ll need to ask permission to get to the sunny side for photos. At the shop, West High Street turns north and changes to High Road; at this intersection, Zimmerman Lane continues west into a farm. There are some nice photos available from the farm lane, but it is strongly recommended you leave your car and walk in, and be respectful of the property and animals here. 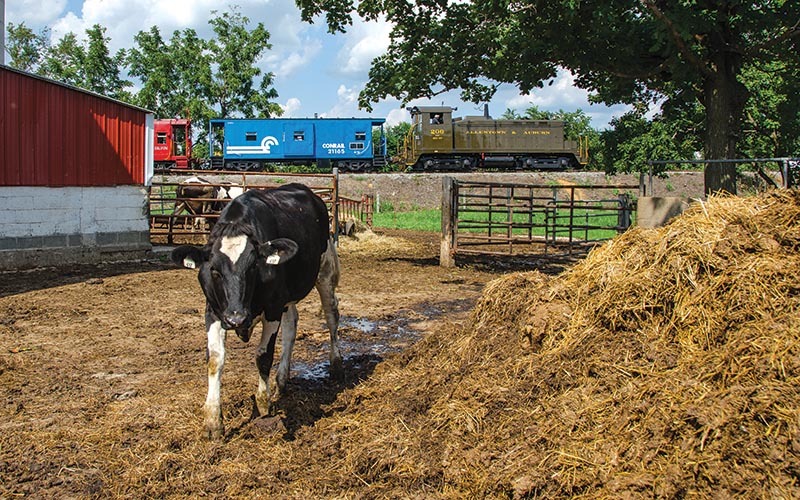 So far, the farm owners have not minded the occasional railfan wandering in for a quick photo; if you see someone, it’s a good idea to let them know what you are doing — they don’t bite. The primary power for the Allentown & Auburn vintage EMC SW 206 originally built for the Philadelphia, Bethlehem & New England in 1937 (construction no. 654). After passing through a number of owners, it arrived at the A&A at the end of 2014. The locomotive faces east but, being an end-cab switcher, it photographs well in either direction. 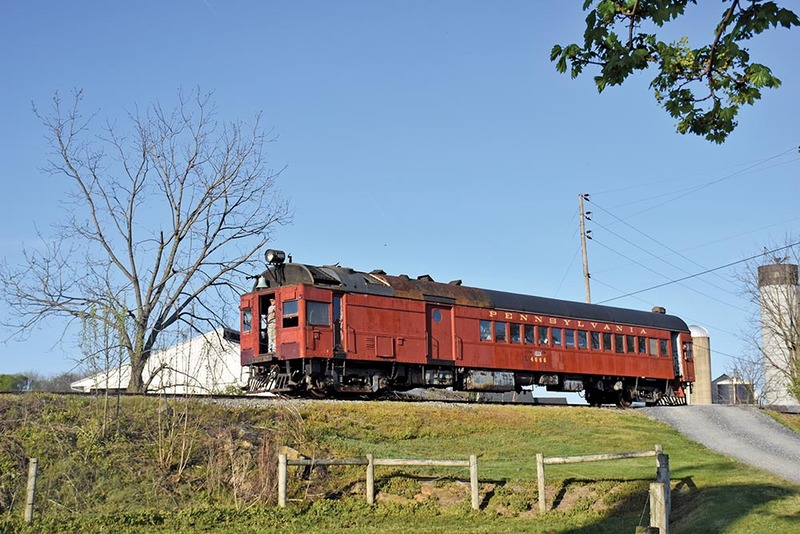 The 206 is the oldest continuously-operating in service locomotive in the country. Also of note is former Pennsylvania Railroad gas-electric 4666. A Brill Model 660 built in 1930, it was retired by PRR in 1963. It was sold to private owners and eventually made its way to the Black River & Western in 1979 where it operated for many years. In 2016, it was moved from Ringoes, N.J., to its new home on the A&A. 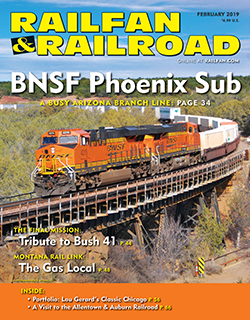 Growth is on the horizon as the railroad works to entice regular freight and transload customers back to the rails. In the meantime, the Allentown & Auburn is preserving the heritage of a scenic Reading branch line in the heart of Pennsylvania’s Bucks County for future generations to enjoy.